Malaga Bus station is situated centrally and has very good connections with other means of transportation. The Bus Station is conveniently located next to the Malaga railway station and there is as well a Bus service to Malaga Airport. If you are looking for Malaga bus transfers or to hire a bus at Malaga airport, you should check the Malaga airport transfers websites we recommend or the timetables for public buses from the airport. Choosing any of them is a good choice. Malaga bus station was inaugurated in 1985 in a post-modern design and with spacious installations for a great number of busses. Travelers are sheltered by a canopy and an arcade which safeguard from possible inclement weather. The station operates with many companies with destination to the cities and villages in Malaga, Andalucia, Spain, on international level and to the north of Africa. As there are not many international flights to Granada, many travelers fly to Malaga and then take a bus to Granada and Sierra Nevada. The railway station Maria Zambrano with its commercial centre is just over the street. 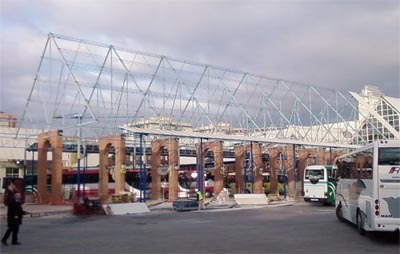 From the Malaga bus station we will be able to get a bus to our destination. Bus to Marbella, Estepona or Nerja can be taken at the bus station, as well as other long distances buses to Granada, other provinces of Andalucia or or other cities in Spain like Madrid or Barcelona. Facilities in the bus station include a Cafeteria-bar, newspapers, souvenirs, and a youth centre. Outside you find a 24-hour taxi stop and in autumn there is a stall selling roasted chestnuts. There is no public parking. One of the major advantages in comparison with other bus stations is that Malaga Bus station is situated less than one kilometre from the historic city centre and not in the outskirts. In the near future the bus station will be linked with the railway station, the suburban train and the new Malaga Metro. Malaga bus station serves Andalucía well but the difficulty in buying tickets in advance and limited timetables do make to rent a car in Malaga instead a consideration to take in mind. Train station is just 10 m.